Puerto Rico is a territory of the United States located in the northeast of the Caribbean, East of the Dominican Republic and West of the Virgin Islands. 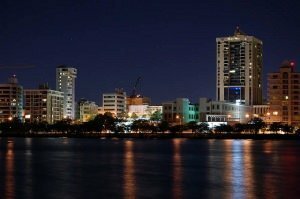 The capital is San Juan, the biggest city in the country. Puerto Rico was a Spanish colony from Christopher Colombus’s arrival in 1493 until 1898, date of the Spanish American war. Since 1917 Puerto Ricans have been officially recongised as US citizens. Both Spanish and English are official languages, with Spanish the most spoken language by the population. The official currency in Puerto Rico is the US dollar. 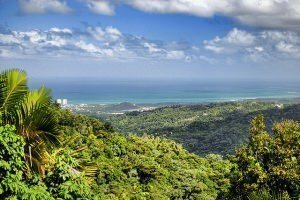 Puerto Rico has a tropical climate with a minimum temperature of 19 degrees Celsius and a maximum of 29 degrees. Furthermore, it has a number of ecosystems; dry forests and rain forests, mountainous regions, coastlines and beaches. Puerto Rican culture is a result of the influence and mixture of a number of other cultures, within which there are three main classifications; indigenous, Spanish and African. Many of the cities names and names of food have been inherited from the indians, whilst the Spanish colonists provided the language, catholic religion, traditions and culture. The Africans slaves introduced la bomba and la plena (a type of typical music and dance), as well as painting. 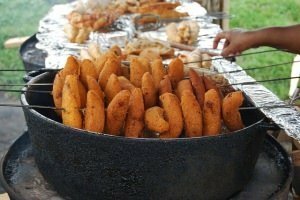 Gastronomy is very important within Puerto Rican culture, based on a mix of the three cultural influences. However since the end of the 19th Century it has been more greatly influenced by US cuisine. One of the most typical and well-known dishes is ‘la alcapurria’ , small crispy pastries made of plantain dough and filled with meat or crayfish. The national anthem of Puerto Rico is ‘La boriqueña’. The most important sports in Puerto Rico are basketball and baseball. 2nd Monday of January, Anniversary of Eugenio M. De Hostos. 3rd Monday of January, Anniversary of Martin Luther King (US). 22nd March, Abolition of slavery. 16th April, anniversary of José de Diego. 4th July, Independence Day (US). 17th July, Anniversary of Luis Muñoz Riera. 27th July, Anniversary of José Celso Barbosa. 12th October, Discovery of America (also known as Colombus day). There are 21 airports in Puerto Rico, three with international flights: San Juan, Ponce and Aguadilla. The San Juan metro runs between some of the main metropolitan areas of the capital. The Metropolitan Bus Authority operates busses around the metropolitan area that includes San Juan, Carolina, Guaynabo and Bayamón.